This 1970s California ranch kitchen remodel made use of existing cherry cabinets (refinished) while all the tile countertop, backsplash and appliances were replaced. 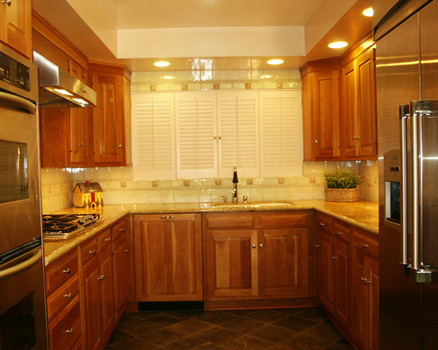 A peach and gold granite was selected to complement the cabinets. New green ceramic tile with a decorative band was used to accent the space and frame the custom tile lake painting over the cooktop. The worn hardwood floors were replaced with a natural slate laid on the diagonal to create a feeling of a larger space. New recessed lighting was added as well as undercabinet lights.